With Easter Island being almost slap bang in the middle of Pacific meant there weren’t any flights direct from New Zealand. As part of Chile; we had to fly 10 hours to Santiago first, have one night at an airport hotel and then fly early the next morning- 5 hours back in the direction we had just come from. Apart from being all but mugged by a taxi driver and a horrible greasy steak at the airport hotel, our overnight in Santiago went by quickly. 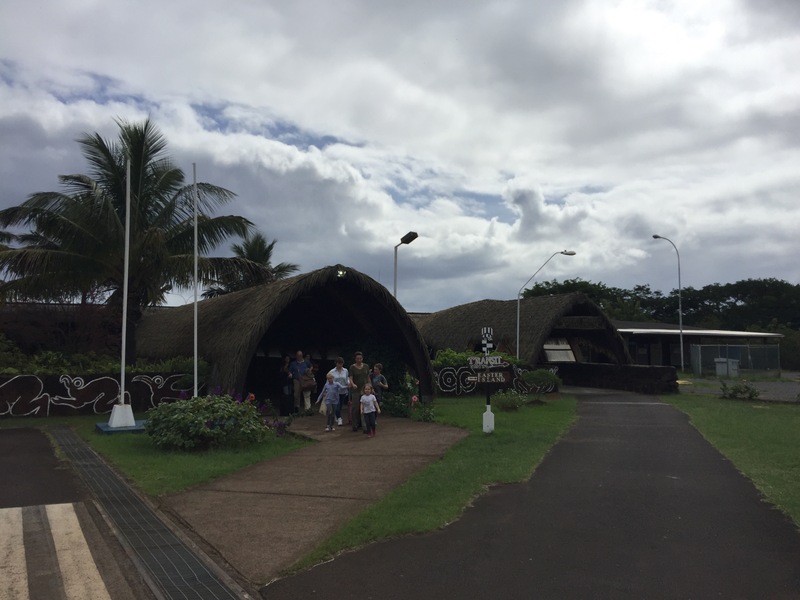 We would be back for a couple of nights after Easter Island which is why stayed near the airport this time. We landed on Easter Island or ‘Ilha De Pascoa’ as it is known locally around midday. The runway stretched from one side of the island to other on the southern side. The terminal building was cute with a thatched straw roof. Being part of Chile this counted as a domestic flight so no special Easter Island stamp, but as foreigners we did have to pay a steep $80US park fee each. We knew our hotel was close to the airport, and located in the only town on the island. Jumping in a taxi we drove for about 3 minutes and we’d arrived – a little embarrassing and it was easily walking distance! It was a small family run hotel, the room was small but clean and there was a free breakfast included which we weren’t expecting. First job was to sort some transport for our time on the island. The famous heads or Moai 🗿are dotted around the island mainly along the coast. We knew it was about a 2 hour drive around the whole island so we needed transport. The town had many rental places from scooters and cars to quadbikes and bicycles. We opted for a quadbike and despite the warning labels on the bike itself, the salesman guaranteed two people could ride, so we donned some helmets and set off to find our first Moai 🗿. The first set at the ‘Tahat Archeological Complex’ were close by the town: about 10 minutes. We parked up and walked across the fields to the coast. Four Moai and a stump sat on the ceremonial platform. Strict rules forbid anyone getting too close or touching so you are kept behind a piece of string a few feet further back than you’d want to be. Nevertheless we took hundreds of photos with the grey stormy clouds in the background. 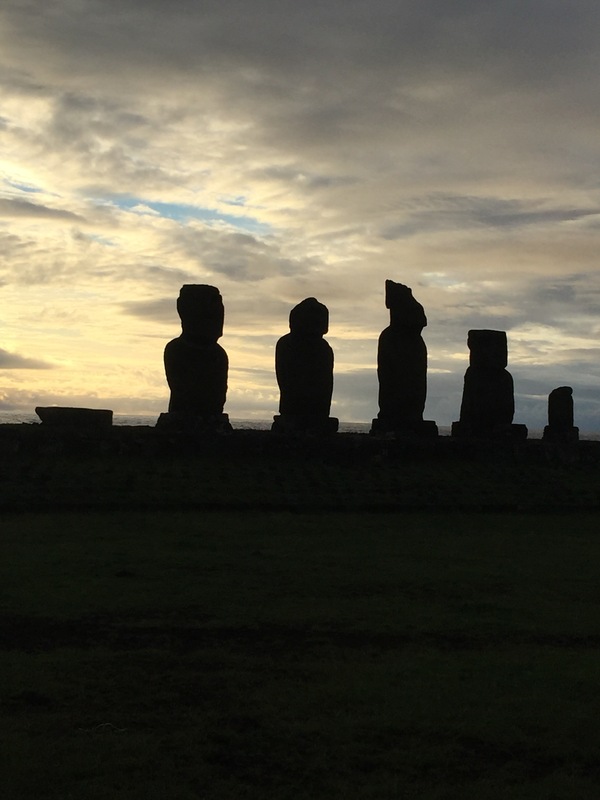 The first set of Moai looked wind swept and eroded, the middle two were missing half of their heads, the fourth was squat and fat and the last was now just a stump. Just further along were another two Moai each sat separately. The first quite eroded but the second had been well preserved. He (i’m assuming they are male!) had a good face structure, body, and the first hat or top knot we had seen. He’s also had his eyes painted on which gave him an odd expression that he was laughing to himself! After a couple of selfies we moved on. 15 minutes down the road at the Hanga Kio’e complex was a lone Moai. He looked like what I had imagined, thin tall and on a wind swept island all alone. The waves crashes behind him as the grey clouds started to break. Next we parked up the quad bike, and went hiking up the coast to some caves at Motu Tautara. Here we had to have our ticket stamped before we could proceed. The walk took us along the coastal cliffs to where we eventually found some caves. We had been imagining sea caves but found more large holes than caves created by ancient lava flows. Mike flew the drone around the coast and we hiked back. It was getting late but the sun wasn’t due to set till 8pm. After some food in town at a little beach side restaurant we drove back to the first site Ahu Vai Uri for sunset. Clearly every other tourist had the same idea as when we arrived 50 people were sat on the bank watching the sun set between the Moai. After watching the red skies turn to darkness behind the Heads, we decided to call it a night and navigate back to the hotel on the quad bike. The following morning, after a terrible nights sleep, we had a lay in and some free breakfast and then went back to nap. The dreaded jet lag from Auckland had caught up with us and we weren’t sure what time let alone day it was. Eventually we got out after midday to find the sun baking down on the island. 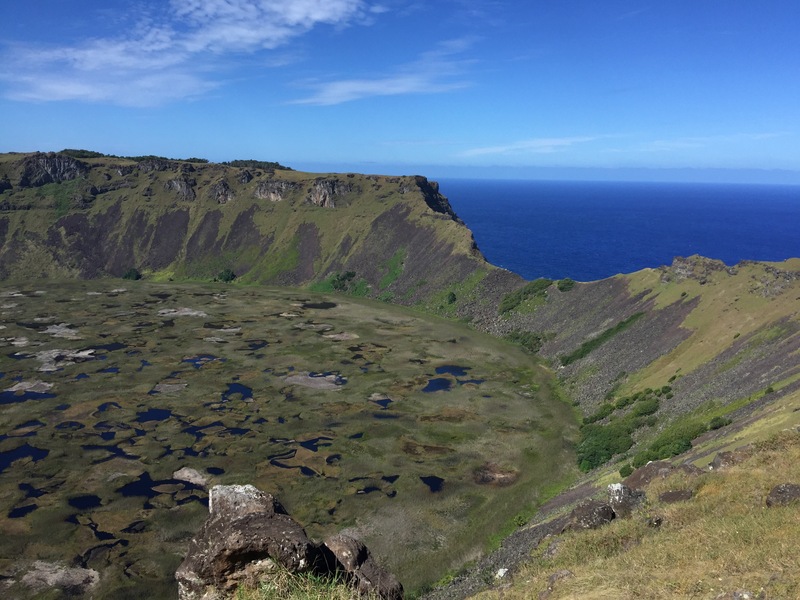 We took the quadbike up to the southern crater ‘Rano Kau’. It wasn’t far from our hotel and was meant to be quite special. And after a steep climb up the side of the extinct volcano we were greeted with a beautiful view. The inside of the crater was now a wetland haven for flora and fauna and it reflected the blue sky perfectly. The side of crater which overlooked the sea had long since crumbled and fallen leaving a view to the ocean. We walked up the side and Mike flew the drone in the high winds. A struggle but worth it for the photos. A bit further around the crater was the ancient village ‘Orongo’. Stone buildings facing the sea built with thin slate type rocks could be seen. The Moai that was here is now in the British Museum. Again we had our tickets stamped and walked the short tour around the archeological sight. We took the drive back down the mountain and then a dirt road out to ‘Vinapu’ an archeological site that had two Moai face up in the ground and various lumps of rock that were once something. Every other rock on the island seems to be the remains of a Moai. After, we drove up a dirt track to the coast till we hit the tarmac road. The sea was dramatic here on the west side of the island as huge waves crashed over the small sea cliffs making for some good snaps when we came across an isolated hut and boat. What happened next was shocking. Mike drove the quadbike! And not just for 5 minutes but for a good half an hour or so into the interior of the island to ‘Ahu Akivi’. It was immediately apparent that these were the best Moai we had seen so far and of course the busiest with several bus loads of tourists already there. Seven near identical figures, with bodies and heads intact, stood on the ceremonial platform in the middle of an open field. Tickets were of course checked again and we wandered slowly around. The Chinese tourist bus departed and we were left by ourselves (and the ranger). Struck by their beauty we had to fly the drone but it was too risky right next to them. So we drove a short distance round the corner and did. Again strong winds hampered our efforts but some good shots were taken as the setting sun cast long shadows. From here we headed back into town and found some food. Still struck by the Moai we had just seen we headed back to ‘Ahu Akivi’ for sunset (after getting lost up various dirt tracks that turned out to be driveways). The red light and empty scene made good drone photos. The problem now being it got dark very quickly and with a long dirt road back into town. No street lighting, just the pathetic headlights of the quadbike to guide us and the stars coming out above. We got back and both slept much better after a busy (half) a day of quadbike going it around the island. So far we had stayed relatively near to the main town. Tomorrow was time to explore the uninhabited larger side of the island and arguably the more famous Moai 🗿. ← Can you see New Zealand’s north and south islands in ten days?